While the stock, switching 5VDC power supply for the Perseus is among the quieter ones, it doesn't perform adequately in an extremely low noise environment. 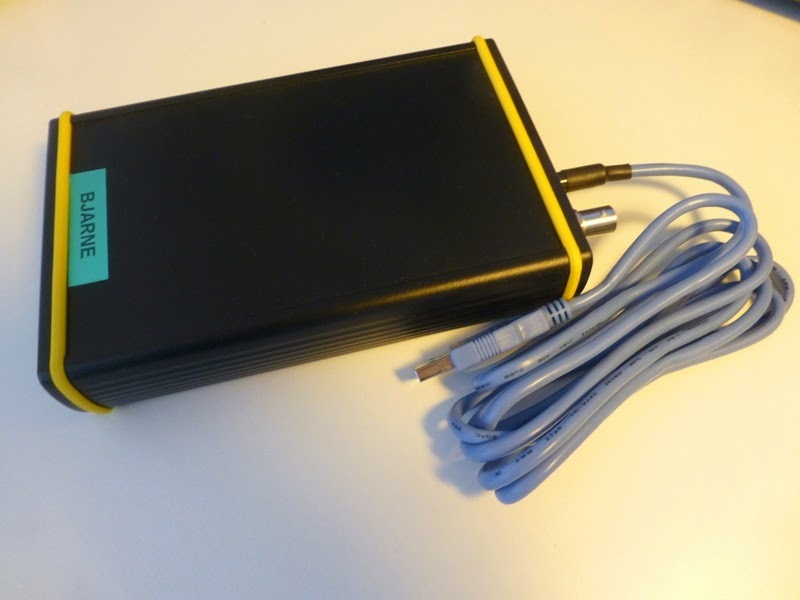 Linear 5V power supplies aren't abundant, and they often come at a price. Unlike the RF Space SDR-IQ, the Perseus draws too much current to be powered from most PC's USB 2.0 outputs which are usually limited to 500 mA. However, with the advent of the USB 3.0 standard, this has changed. The Perseus typically draws 700-750 mA, while a standard USB 3.0 output will deliver around 900 mA - more than enough for a Perseus. It's a custom made power cable for the Perseus. It sells from the USA for a nickel short of $20, + shipping. I've bought three of these, and they work perfectly. The seller claims they are "roughly 6 feet", which is roughly true as the last cable I bought measured in at 5.75 ft/175 cm. A cable like this is an absolute must have if you want to do an outdoor DX session. You can power your Perseus from a laptop or a battery pack, and use the laptop to run the Perseus from a different USB port. All my three Perseus in Kongsfjord are now powered from PCs and they seem to cope well. This particular item will pop up if you do a "perseus sdr" Ebay search. Admittedly there are literally hundreds of Chinese-made USB-to-2.1 mm cables on Ebay, with prices as low as 0.99 USD/EUR including shipping. I haven't spotted any 2.5 mm cables though. Whatever you do, always check the polarity of the connector before you power up the Perseus. Mistakes do happen.